As I patently wait for all my tax refund to come in.. so that I can go get the long arm I’m wanting to purchase. I figured I’d make a bunch of charity tops so that I will have something to practice on before I tackle one of my larger nicer quilts. So I started digging through boxes and bins of fabric and gathered up a bunch of orphan blocks that have been kicking around the sewing dungeon. Some of these I made others were donated to me. This is the first posting of some… I say some of the blocks as my design wall (made from flannel backed plastic picnic table cloths) was not large enough. I started out sorting out the blocs by colors so that the quilts would look like they were actually planned. So far I have completed seven tops. 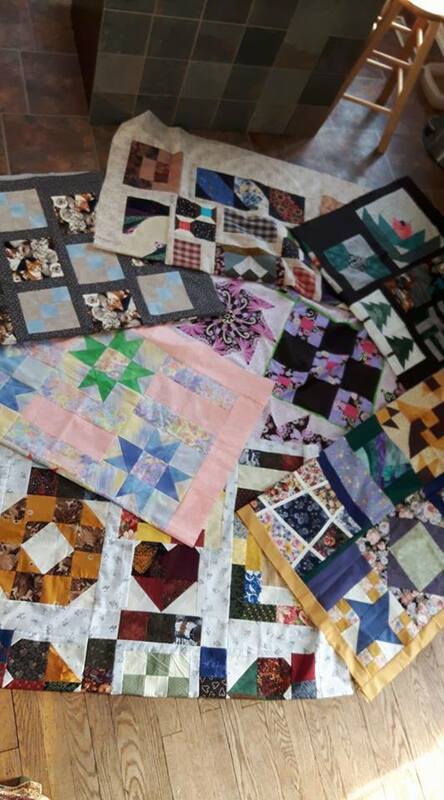 I still have enough blocks to maybe make 5 more quilts. But I have now have grown bored with this so its time to do something else. They will be there when I want to make more. We just spent the first half of the Easter break totally de-stashing and rearranging the basement to make room for the long arm. Furniture got moved, Tossed and many other Junk. I even went through all those bins that have been sitting around for the last… 20 or more years. All my College books and notes from the Interior Design Technology course are now in the garbage. It’s amazing how much junk one keeps over many years. We have taken 2 loads with the pick up loads to the dump. I can say now that the basement looks way larger. I really should have taken before pictures, oh well you really don’t want to see the mess. I share the basement with my son. This picture was taken from where the long arm will be. You’ll see this when it’s actually set up. Yep it’s not finished and the reason for the puzzle mats is that for one its warmer on the concrete, and we flood occasionally since we live in low lands and we found it is easier to pull out the mats and take them outside and rinse them after a flood. I’m really thinking that minimizing is the way to go. Now at least my kids will have way less stuff to go through when I leave this world. Why is it that we spend the 1st third of our lives collecting, the 2nd third using and now in my 3rd I’m decluttering. I’m thinking that the whole house will eventually get uncluttered, but that is for an other holiday… Summer will be here soon.